On the first Monday of the month, I usually share an income report. I love reading income reports because they give me new ideas to try with my blog, and they inspire me to keep pushing when the going gets rough. But after reading Profit First (a book I highly recommend! ), I’m changing my whole accounting system. Second, I wanted to be able to show you in real time how I make money from my blog. For example, some affiliate programs don’t pay out until you earn a certain amount of money. For me as a small blogger, it can take months to earn that money, so I was worried that I’d report income 5 or 6 months after I had earned it and forget what strategies I used to make money. Well, this system of accounting gets messy fast. It looks neat and tidy in my income reports, but behind the scenes, my spreadsheets and bank account were…ahem…a hot mess. So, I was ripe for a new accounting system when three people in one week recommended the book Profit First. What’s Profit First All About? The central message of Profit First is that your business should serve you, and not the other way around. From a financial stand point, having a business that serves you means that you should always pay yourself a profit from your business earnings, no matter how small that profit may be. And this is where my blog hasn’t been serving me. As soon as I started earning money, I started spending money. All the money. In my very first income report, I was loud and proud about the fact that I was going to reinvest every penny I earned that month back into my blog. And I did. I like to think of myself as a disciplined person, but somehow all my discipline melted away when I had a few hundred dollars rolling in from my blog. If you find you’re overspending on your blog, download my Blogging on a Budget Tool List. 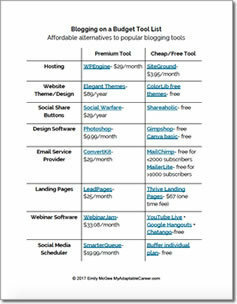 It’s a list of 10 cheap or free alternatives to some of the most popular blogging tools. The author of Profit First, Mike Michalowicz, riffs on the “envelope system,” which is a budgeting system where you divide up your income into various envelopes. The money in each envelope has a specific purpose. So as a business owner, I have one “envelope” for my salary, one for my business expenses, one for taxes, and most importantly, one for profit. The author provides guidelines for what percentage of your revenue should go towards each envelope/account. For me, this was the most helpful part of the book! I’ve always wondered how much money I should put back in my business, and this formula made sense and gave me guidelines to shoot for. I’m still overspending a little bit on my operating expenses, and it’s cutting in to my salary (lol…a salary of about .50/hour right now), but now I have a target to shoot for! One of the core messages of the book is that you should always set aside a small percentage of money each month as profit. Then, at the end of each quarter, withdraw half of your profit and spend it on something outside of your business. I absolutely love this idea! My revenue is small right now, but I’ll still have enough profit to take my husband out to dinner at the end of this quarter, thanks to my business. It feels awesome to know that I have a profitable business, even now in the early stages. In order to earn a profit, you can’t let your business expenses get too high. While I do think you should make some initial investments in your blog, once you’re earning money each month, it’s important to spend strategically. In Profit First, the author argues that most of us are spending too much on operating expenses. We feel like we need to invest more money to reach the next milestone, to scale our business, or just to keep up with the business owners we see around us. The author argues that in order to grow your business you don’t need to spend more, you just need to be more creative. I love this philosophy, and I’m really trying to use it for my blog. Instead of feeling like I should spend more money on BoardBooster to automate my pinning, I’m sticking with my budget and pinning in person a few times a day. Before I buy new office supplies, or new blogging courses, or pay for a new tool, I check my operating expenses account and see if I can afford it. Likewise, I don’t want my blog readers to spend money they don’t have on products they don’t need. With that philosophy guiding me, I’ve started offering more affordable alternatives to my time management course. The course is perfect for someone who wants a detailed planning system, in-depth tutorials, and a robust time management plan. But for those who need a “lighter” and cheaper solution, I now sell a set of done-for-you blogging schedules and an ebook of done-for-you blogging routines to follow. The done-for-you blogging schedules have been selling particularly well, so I know I’m not the only one who is looking for affordable blogging solutions. Want to know what other affordable blogging tools are out there? Download my free list. Your business should be working for you. This means that if you’re not earning a profit, then you need to step back and make some changes. You’re probably overspending on your business operating expenses. It’s natural to want to reinvest in your business, but if you want to be profitable you have to practice self-control on the expense side. Your business will show you when it’s time to scale. As you generate more income, you’ll have more money in your operating expenses account to use for growth. You can still grow a business and be profitable at the same time. You just need to be creative. Sticking to a framework, like the one laid out in Profit First, can help spark that creativity. I love reading, so please leave me a comment with your best business book recommendations! To read more key takeaways from my other favorite books, check out this post on the book Lean In or this post on Arianna Huffington’s book Thrive. Awesome! Check your email to grab the tool list.